Twilight Imperium. Even the name sounds imposing, the lingual equivalent of the Star Destroyer drifting into sight at the beginning of A New Hope. Next is the box, a cardboard block solid enough to survive re-entry to the atmosphere. Inside, more than 1,000 miniatures, cards, tokens and player boards, crammed with the details on 17 completely different races, from the peaceful lion-like Hacan to the tech-infused L1z1x, all of which have individual backstories and play styles. Don’t worry – you’ll have plenty of time to learn their ins and outs during a game that lasts anywhere from four to 12 (or more) hours and involves the careful juggling of politics, military conflict, exploration, resource production, economics and diplomacy. 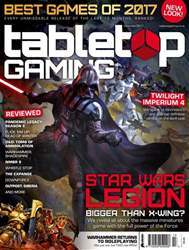 It’s little wonder that Fantasy Flight’s strategy space opera has earned a reputation as one of – if not the – tabletop’s most daunting and grandest experiences. Like any epic accomplishment, Twilight Imperium had modest beginnings. It started as the dream project of Christian T. Petersen, a Danish gamer turned entrepreneur who during college had started up Fantasy Flight Publishing as a comic book distributor bringing European oddities to the US. The company quickly floundered, losing all the money it had within two years, prompting the need for a change in direction. Petersen had previous experience importing games into Denmark and running conventions, and had self-taught himself game design and production on the side. He approached the board of directors and investors with an ambitious proposal to turn the company around.